The Pole Dance WOW Catalog is a brand new invention for pole dancers!!! Designed as a colorful, beautiful and convenient A5 notepad with 50 pages that contains 424 elements, divided into 10 levels of complexity, it is a premium class collection of elements and tricks for Pole dancers of any experience! - All 424 elements are divided into levels of increasing complexity. With the help of this catalog, you know where to start and what to do next. - All elements in one place - making it unnecessary to look anywhere else. - Track your progress by checking learned and mastered elements - simple and convenient - It will prove most helpful in composing your own dancing routines and programs. - It is colorful, beautiful and emotional; a great idea for a gift. - It will help you to evaluate your level in pole dancing. - There is no need to remember what you did on previous lesson, every bit of progress is marked and accounted for. 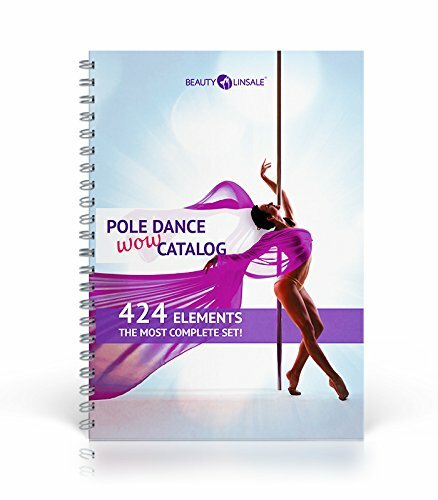 - With the help of this pole dance catalog students learn Pole Dance 45% faster. - It is an invaluable helper for a trainer. Planning your lessons and routines has never been easier. - You can get a diploma passing the milestones and be proud of it. The Pole Dance catalog was created by Pole Dance champions with a total training experience of more than 25 years. If you have any questions about this product by SP Seredniak T.K., contact us by completing and submitting the form below. If you are looking for a specif part number, please include it with your message.